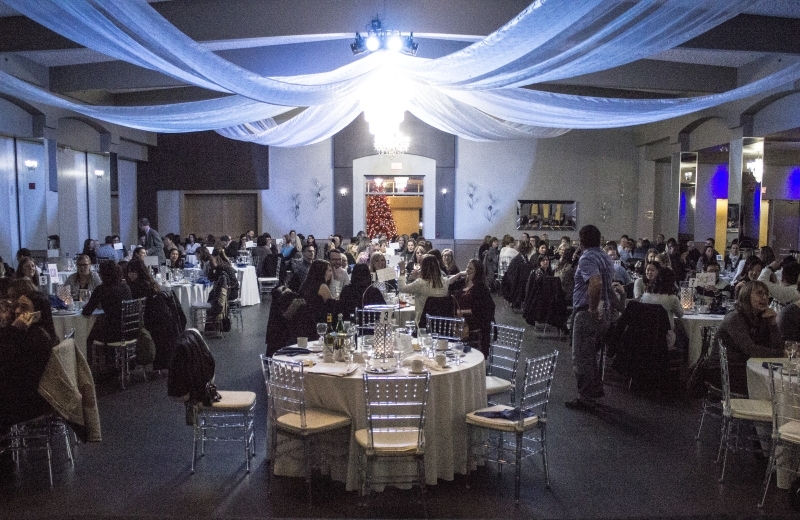 Niagara Health honoured healthcare professionals who embody the spirit of collaboration at the 12th annual Interprofessional Practice Awards on Thursday, Nov. 22. This year’s recipients demonstrate leadership and excellence in line with Niagara Health’s strategic purpose, vision and values, providing extraordinary caring, teamwork, forward thinking and innovation. Awards were handed out to professionals across a variety disciplines and Niagara Health sites. Interprofessional practice combines professionals from across disciplines into one healthcare team to optimize patient care. This model enables our teams to share information, knowledge and best practices to improve patient outcomes. 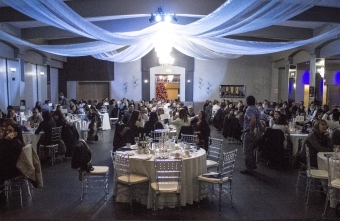 Mr. Ismail said Niagara Health is also grateful to the Ontario Public Service Employees Union for their generous contributions and sponsorship to make Thursday’s banquet a success. Vonda identified a patient who had been struggling with attendance to group and was aware that this individual had complex life challenges. Vonda called the patient to clarify what the challenges were and, after her phone call, the individual attended every session of the group. She was able to recognize the patient’s struggle, offer her support and allowed the patient to become successful with her treatment goals. Recently a nurse was having problems obtaining a blood sample from a young patient and called for help. Carrie quickly responded and put both the child and mother at ease with her kind words and actions. She gained the young girl’s trust and was able to draw her blood with no problem. The mother thanked Carrie for being so calm and kind with her daughter. Carrie also gave the young patient a gift: an inflated surgical glove decorated to look like a hedgehog. Patti is a Charge Technologist who exemplifies teamwork and leadership. She is quick to assist her staff whenever needed by putting aside her daily work and working the bench when the area is short-staffed or there is increased workload. Patti approaches all aspects of her job with a positive attitude and collaborative spirit. Christa was able to develop a rapport with a patient with an eating disorder, when no other health professional was able to do so. Christa was able to engage and motivate the patient to slowly improve their eating and acceptance of various foods. The patient was able to gain weight and improve their overall health as a result of Christa’s exceptional care. Brendon proposed a new pharmacist practice model that mirrors the physician team-based approach. With this new model, patients are seen and cared for by the same pharmacist from admission to discharge, creating continuity of care for our patients. Our pharmacists have also reported increased efficiency and continuity for patient care. To improve wait times for our total parenteral nutrition (TPN) patients, this group brainstormed and researched potential solutions. They collaborated with the Home TPN Team at HHS and the LHIN Home and Community Care to create a new model for Niagara Health. This innovative program will help to improve flow and utilization as it will free up hospital beds as well as improve quality of life for these patients as they will receive specialized nutrition treatment in the comfort of their own home. When a previous patient of Jenny’s wanted more cognitive language stimulation at home, Jenny searched for and compiled a personalized homework package and mailed it directly to the patient. In addition to the engaging and goal-specified worksheets, she also included a list of activities and games that could be purchased for fine-tuning communication, as well as the locations and pricing of the products that she was recommending. Joanne's extraordinary caring was demonstrated when she helped to fulfil a patient’s last wish. The patient had decided to stop dialysis and wanted to go to the beach one last time. Joanne not only arranged all the rides for the patient’s wish to come true, but she also accompanied the patient and her daughter. The joy on the patient’s face was immeasurable. Joanne is truly a remarkable person and works with all our disciplines to make our patient experience a special one. Lori is an amazingly helpful and soothing presence for young patients and their families on the Children's Health Unit. Lori gets to know patients and brings them toys, art supplies and other items to help support children during difficult times. Lori also helps to organize an annual diaper drive that collects diapers for needy families in the community at Christmastime. Lanny arranged biweekly therapeutic discussions that were tailored to his student’s learning. Lanny allocated time every day to review patients and strategically selected patients for his student to work with so they would have experience with commonly seen conditions. Lanny is very approachable and was always happy to answer questions, explain concepts, and share clinical pearls throughout the rotation. Craig is a huge advocate for student learners, taking on many students each year from both Occupational Therapy and Occupational Therapist Assistant/Physiotherapist Assistant programs. Craig recently helped to initiate and plan a transfer skills workshop that, will give rehab assistant students a chance to learn about transfers before their formal placements begin. Tawnya regularly supports students in placements and through job shadow experiences. She is an enthusiastic supporter of students learning more about the interprofessional team and the role of clinical nutrition. Tawnya provides multiple role presentations and tours for students from the Interprofessional Practice Education units every term. Sarah demonstrates the highest level of patient care by communicating effectively and motivating patients to achieve their rehab goals. She can be seen daily listening, helping and encouraging patients in the department treatment room. She plays an integral part in providing therapists, students and fellow colleagues with the highest level of assistance. Ashley is a dedicated staff member who comes to work with a cheerful demeanor every day. Ashley approaches any task or issue with collaboration in mind, speaking with the people involved and looking for a mutually agreeable solution – whether it is dividing up the work during a shift or planning around her school schedule. Bob brought Niagara Health’s Clinical Pastoral Education program into Wilfred Laurier University's Martin Luther College. Bob’s work to achieve this has also made contribution to standardized curriculum development for the profession as a whole. Bob has a growing body of reflective writing on medical assistance in dying. He continues to make formative contribution to the Ontario faculty of teaching supervisors within the Canadian Association for Spiritual Care. Claire has recently taken on a new role as an outpatient dietitian in the Kidney Care Program. During this short time, she has updated many of the education pamphlets to reflect current evidence-based practice to use when educating patients, produced seasonal newsletters with education tips and recipes for the renal population, and has started a grocery store shopping guide for patients who are struggling with making diet choices when following a renal diet. She has also developed a class for the pre-dialysis population to reduce wait times for individual appointments for this group. Her enthusiasm for making improvements is admirable and contagious.